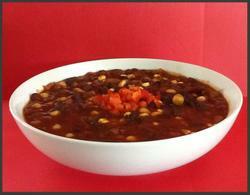 Packed full of delicious, nutritious beans our healthy Vegan Chili will be a family favorite. Make a large amount, easy since the steps are the same, and freeze it in individual quart containers for several quick meals. Combined with a lovely green salad and a good grained bread, your family will recognize you as the Everyday Gourmet that you are! You can use any good Vegetable Broth, either homemade or purchased. We use the liquid that the various beans were cooked in which gives the end results a very deep and delicious flavor. Spray a very large soup or stock pan with non-stick spray and then spray it again with Olive Oil (if you don't have a sprayer just add enough Olive Oil to lightly cover the bottom of the pan). Get the pan very hot over high heat and add the Onion, Carrots and Celery and turn the heat down immediately to the point that the vegetables are softly sizzling. (It is VERY IMPORTANT not to look away during this short process. Burning the Onions would ruin it.) As these Vegetables begin to soften a bit, add the Mushrooms and Garlic. Cook for another 2-5 minutes. Now put the Beans into the pan followed by 4 Quarts of Broth. Stir well to combine. Turn heat up and bring to a rapid boil and then turn the temperature down until it reaches a gentle simmer. Simmer 2-4 hours, stirring once in awhile and tasting. Adjust flavors and add more liquid as required. 16 Quarts seems like a lot of Chili. We are surprised by how fast the two of us go through it. We eat it frequently over a Baked Potato and for lunch over a large bed of Lettuce.